The most important features in finishing of small runs, e.g. after digital printing are flexibility and quick changeover. With regards to paper drilling that means quick change of hole pattern. The Dürselen on-demand drill heads can produce all hole patterns. The heads are programmable and freely positioning. 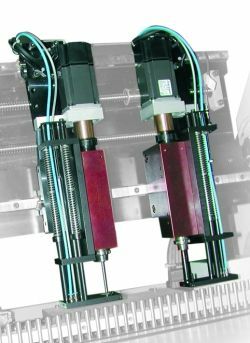 All hole patterns are programmed in the controller of the paper drilling system and are recalled at the push of a button. Two on demand drill heads then move independently to the different hole positions. Each on demand drill head can be programmed separately with parameters for stroke speed and spindle speed. Thus two drill bits with different diameters can be used simultaneously and with optimum values. Drill bit cooling and lubrication is included in all on-demand drill heads. Changing a drill bit is done as easily and quickly as with Dürselen standard drill heads. Dürselen on-demand drill heads are used in the paper drills PB.10 DoD , PB.15 DoD and PB.11 . The video on paper drilling system Dürselen PB.15 DoD shows changeover of hole pattern at the push of a button.